Combining analytic theory and modern computer-aided design techniques this volume will enable you to understand and design power transfer networks and amplifiers in next generation radio frequency (RF) and microwave communication systems. ultra wideband microwave amplifiers constructed with lumped and distributed elements. A companion website details all Real Frequency Techniques (including line segment and computational techniques) with design tools developed on MatLab. Essential reading for all RF and circuit design engineers, this is also a great reference text for other electrical engineers and researchers working on the development of communications applications at wideband frequencies. This book is also beneficial to advanced electrical and communications engineering students taking courses in RF and microwave communications technology. Professor Binboga Siddik Yarman is currently on a sabbatical in the Department of Physical Electronics, at the Tokyo Institute of Technology, Japan. His full-time position is with the Department of Electrical and Electronics Engineering, at the College of Engineering, Istanbul University. Professor Yarman is very experienced in the field of communication networks, being one of the first engineers to establish computer-aided design (CAD) tools for constructing practical broadband matching networks and multistage microwave amplifiers for optimized communication systems. In doing this, he paved the way for the generation of CAD algorithms to construct practical circuits in the field of communications engineering, including commercial and military communication sub-systems such as antenna matching networks, and multistage microwave amplifiers for mobile and fixed communication systems. He has published a number of book chapters and journal papers on the design of microwave amplifiers, modeling techniques and other design issues concerning power transfer networks, including a section on 'Broadband Networks' for the Wiley Encyclopedia of Electrical and Electronics Engineering (Vol II, 1999). He has also lectured to both students, and practising engineers on these topics for the last 25 years, in Europe, the USA and Japan. 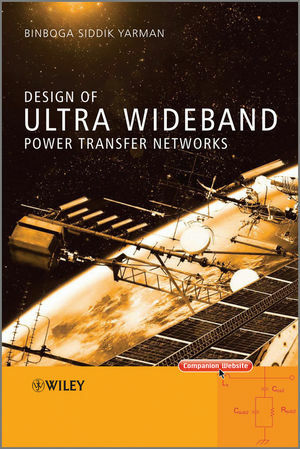 Design of Ultra Wideband Power Transfer Networks Visit the companion website to access additional resources for the book.